Queue is another famous data structure which allows operating from two ends(front and rear) through head and tail. It works in First In First Out(FIFO) fashion. So to remember , queue always supports insertion from rear-end / tail and deletion called as dequeue happens only from fron end / head. Let's see how can we implement simple Queue data structure in Java using a single linked list. We need follow the Cell class we have used in the Stack example in the previous post. 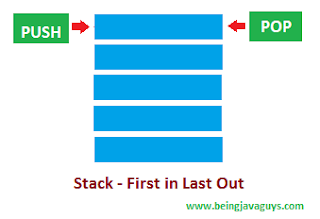 Stack : Stack in first in last out operated data structure ,where the first inserted (push'ed)element into the stack will be taken out (pop'ed) at last. it is like single door room . Those who enters room first will be able to come out only in the last . In other word last pushed element will be poped out first . The below implementation takes/reads size of the stack what user want to create and implements stack operations. System.out.println("Element at " + i + "position is "
1. We can access any stack element when in array at any point of time randomly. 2. Size is fixed we can't add more elements. 3. If we want to remove an element in between the elements then it is difficult to adjust the other elements. 4. IF we want to insert at a particular position in between the array also it is difficult. SQL injection is a code injection technique, used to attack data driven applications, in which malicious SQL statements are inserted into an entry field for execution (e.g. to dump the database contents to the attacker). SQL injection must exploit a security vulnerability in an application's software, for example, when user input is either incorrectly filtered for string literal escape characters embedded in SQL statements or user input is not strongly typed and unexpectedly executed. SQL injection is mostly known as an attack vector for websites but can be used to attack any type of SQL database.